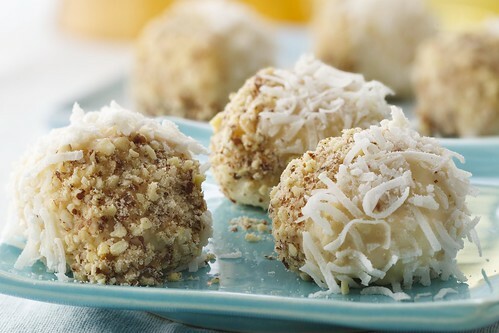 Now, a few things stand out about this recipe for Coconut-almond Doughnut Pop-ems, created by Kathy Matulewicz of Clifton, New Jersey. First? The recipe was created by a fellow Jersey girl. Clifton is a different part of the state than I grew up in, but still, this matters. Second, the recipe is for Coconut-Almond Doughnut Pop-ems. I don't even know what that means, but based on the picture, I want them in my mouth. Third, they include an ingredient called "imitation butter flavor". What? Have you ever heard of that? Fourth, they are easy. As the inventor puts it, "Family favorite doughnuts just got easier! Cut up biscuits; bake up into mini doughnuts, then glaze and sprinkle for the perfect finish." Oh joy! Here's the recipe.